As it turns out, Little Dude has a new favourite show. This is a relief for me, because the only show he used to watch was Let's Go Pocoyo. Now, he also watches Peppa Pig. In fact, I watch it more often than I should too, because I find Peppa Pig and her family very charming, and also like the narrator's subtle sense of humour (is that included in the script for adults like me?). If you are in the UK, you would be very familiar with this character, although it is also broadcast elsewhere around the world. Peppa is a chirpy and bright pig, who has a little brother and fun-loving parents. Since he started watching this show, Little Dude has started exhibiting some characteristics that I can't help but smile about! 1. He's started calling me Mummy. I was Mama to him until now, so it sounds very different to hear him say this. I hadn't expected this change in him, of all things! I thought children stuck to calling their kids what they do until they are teenagers. Okay, I take back what I said above. I wish he didn't call everything 'disgusting'. It's only been used in a few episodes, and I don't think he even knows what it means. But he finds it funny to say it about anything that catches his fancy. Peppa often calls her Daddy naughty, so Little Dude has started saying this to his Dad too. The first time he said it was a bit of a surprise, as you can imagine. I now have a very polite toddler, If he doesn't want something, he doesn't retort with a resounding NO, and politely declines. He's also started saying Please more often. Thank you for that, Peppa! 5. He makes up songs. I don't know if this is a Peppa Pig influence, or a common trait in toddlers, but he's started singing more often. Peppa makes up songs in the show, and I have caught Little Dude singing away in the grocery store, in the car, and while playing! 6. He wants to jump in muddy puddles. I don't mind mud, but there's just one problem. We stay in a desert, which gets rain only about a few days a year. It's really hard to come by muddy puddles! It's funny how toddlers are influenced by television in so many ways, which is why I'm careful about every episode he watches. Luckily, he's only interested in following one show at a time! What's your toddler's favourite show? My little guy loves Bubble Guppies. That's another nice show, with good music! Haha, I can imagine! Sadly, none for us. #4! My 3yo says that too! The first time she said it was when I was trying to make her eat dinner! I just cracked up! Great that you have lots of puddles to jump in! Yes, it is a huge franchise! I'm big on manners for kids too. 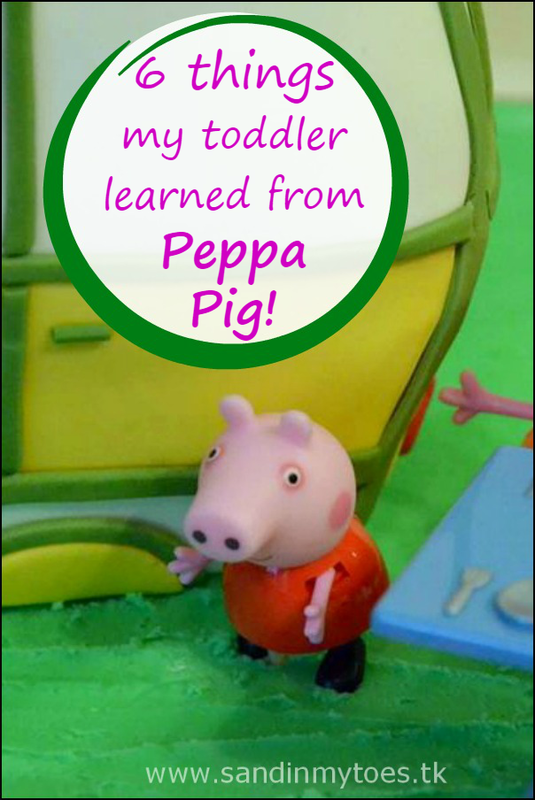 Have to admit we've never been a Peppa Pig household, but I can relate to the things learned, we have several phrases straight from other shows that are frequently used, and do make me smile! (I have this odd feeling that I already wrote a comment on this all about Team Umizoomi... Must have only done it in my head!?!). Team Umizoomi hasn't caught on with us yet, so must have been another blog! She is an interesting character! My son snorted for a while but thank goodness he's stopped. And haha to things being "disgusting" because YES! We didn't have much snorting, but there was some! Peppa Pig is one of my youngest favorite shows! She even falls down on her back and laughs when they laugh!